The Freewell Gear DJI Mavic/Spark Tablet Mount Lite is designed to allow filmmakers and drone lovers to experience the best drone flying experience. It attaches easily on your RC, and its versatility allows you to fit your favorite smartphone, or your trusted tablet phone, securely. The advanced aluminum material used in its construction, the compact design, combined with the lightweight manufacturing technique weights only 8.60 Ounces, makes this an excellent choice as your mount to view the best-quality feed from your drone. It has a completely rotatable ball-head system which allows users to set the angle of viewing of their monitor (smartphone/tablet), as they feel comfortable. The addition of a high-grade and sleek neck strap ensures that you will be able to fly your drone for a longer time, in more comfort than before. Durability – Made from special CNC Aluminum Alloy, it provides the expected durability, especially when you need to fly in rough terrain or more often. Light weight – The Tablet Mount Lite is extremely lightweight 8.60 Ounces, thanks to its sleek and efficient design and the choice of material used in its construction. Versatility – The DJI Mavic/Spark Tablet Mount Lite from Freewell allows you to fit an iPhone 7+ to even an iPad 9.7 Inch (or any smartphone/tablet measuring minimum 11.5 cm and maximum 19.5 cm). Comfortable to use – The advanced 360˚ ball-head allows you to adjust the angle of your monitor according to your favored position, making the drone flying experience even more comfortable and enjoyable. The DJI Mavic/Spark Tablet Mount Lite is the kind of accessory which makes drone aerial filmmaking even better. 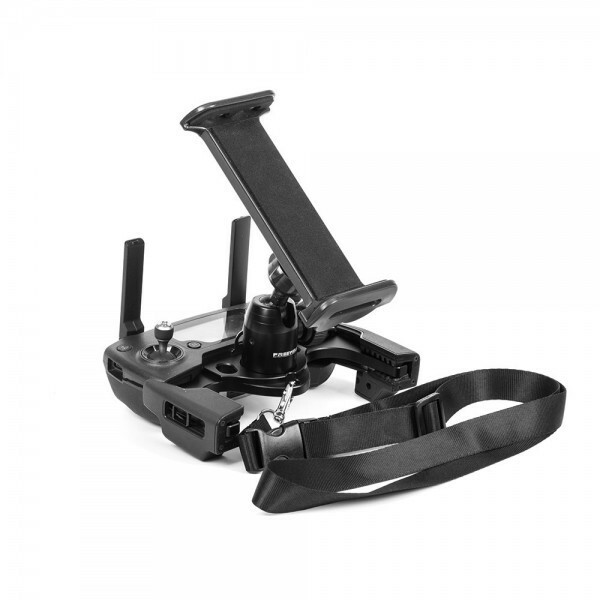 With a larger viewing monitor on your RC secured perfectly, thanks to the advanced mount design, you can stop worrying about constantly having to adjust your viewing monitor which slips with every movement of your body when using other mounts. The DJI Mavic/Spark Tablet Mount Lite is an excellent accessory to get the best footage and the most exciting drone flying experience using a conventional tablet or smartphone as your monitor.